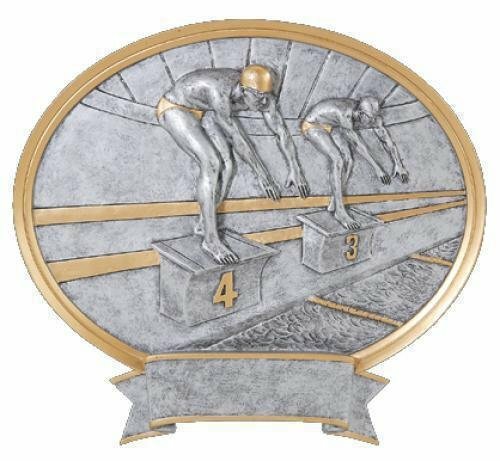 This swimming trophy awards collection contains a wide variety of different swimming award and trophy presentation items. Whether its for first, second or third place, these swimming trophy awards are sure to be received with honor. Boasting a highly polished wood base gives these Elite Series Swimming Awards style that truly sets them apart. The swimmers are shown standing on starting blocks ready to hear the sound of the gun and to be first in the water on their way to victory. Great flexibility is provided with these awards as they are available in both male and female versions, they measure 6" tall and come in a pewter tone finish. The base on these awards provide plenty of room for whatever your personalization needs may be. These awards will be perfect for your next swim meet. Lots of action is packed into these Legend Swimming Awards. The players in the award are raised providing a 3-dimensional look. The swimmers are on the starting blocks and ready to compete while the lanes are highlighted in gold to complete the scene. These oval awards are available in male or female versions along with your choice of two sizes, 6 1/2" X 6" and 8 1/2" X 8". A large area at the bottom of the award can accommodate your personalization needs while the gold and pewter finish complement the look of the award. This item can either be hung on a wall or placed on a desk using the included stand. 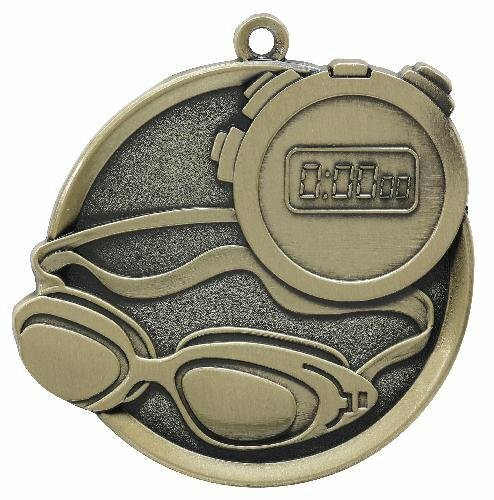 Male 6 1/2" X 6"
Female 6 1/2" X 6"
Male 8 1/2" X 8"
Female 8 1/2" X 8"
This Swimming Mega Medal is perfect for your next awards presentation. 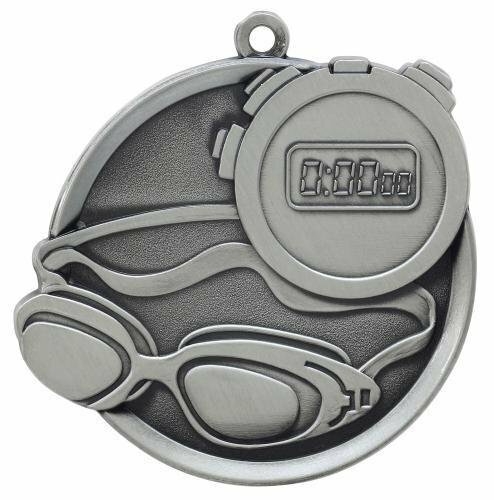 Goggles and a digital stop watch fills the front of this 2 1/4" in diameter medal. In addition to many other sports or activities these medal come in your choice of gold, silver or bronze finish. The back of the medal has more than enough room for all of your personalization needs. All you need to do is pick a ribbon and you are all set to go! 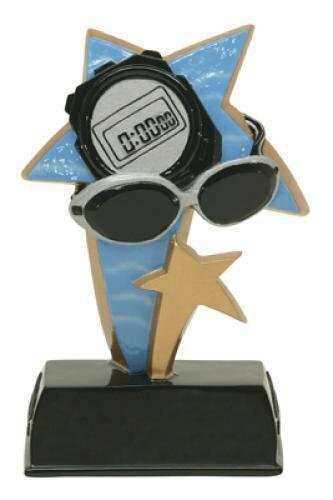 Stylish design along with lots of detail makes these Signature Series Swimming Awards a great choice. The swimmers are shown full extended as though swimming through the water to be first to finish. 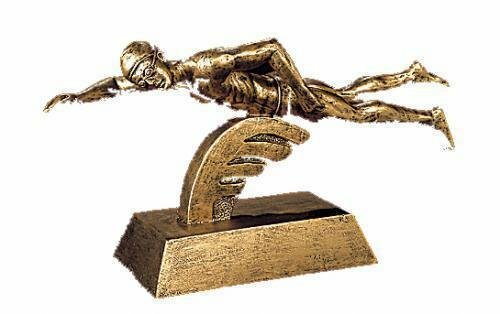 Great flexibility is provided with these awards as they are available in both male and female versions, they measure 5 1/2" X 8 1/2" and come in a gold tone finish. The base on these awards provide plenty of room for whatever your personalization needs may be. These awards will be perfect for your next swim meet. 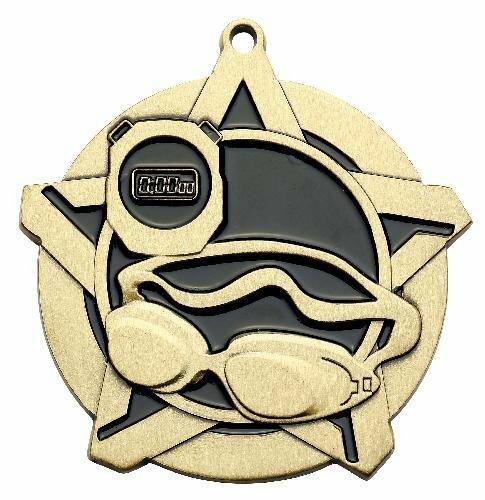 Male Gold 5 1/2" X 8 1/2"
Female Gold 5 1/2" X 8 1/2"
This Sport Stars Swimming award has many unique features. The award is made up of two shooting stars. A gold finish enhances the lower star while full color swimming icons of a timers digital stop watch, goggles, and the blue pool water complete the look. 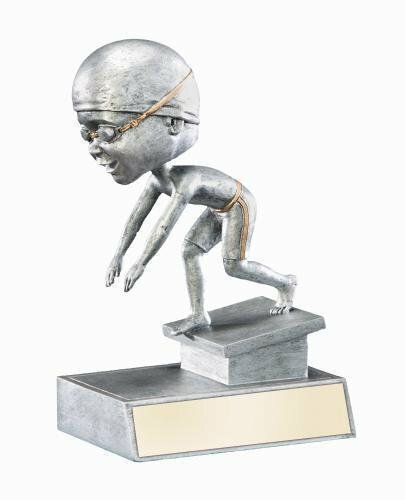 With an overall height of 6" tall this is the perfect award for your next swimming meet. The black base provides plenty of room for your engraving and personalization needs. 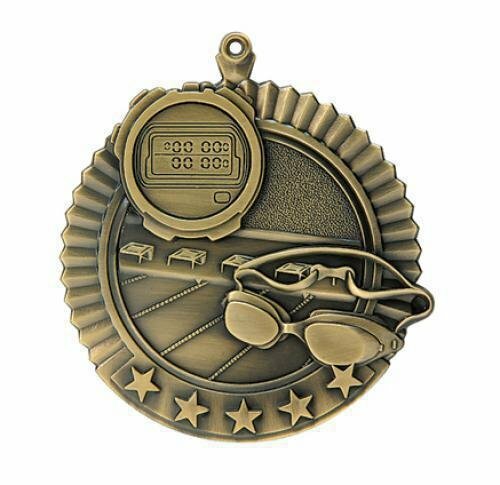 These swimming medals have a distinctive 5 star pattern across the bottom of the medal while the rest of the outside design is of a scalloped edge. The swimming icons represented here are detailed reliefs of a digital stop watch, swimmers goggles, and several lanes of the pool. These awards are 2 3/4 inches in diameter and available in gold, silver, or bronze finishes and have plenty of engraving room on the back. Just add a ribbon and your award is complete. This Female Swim award is a memorable keepsake that will be cherished by the recipient for years to come. A swimmer is depicted with their hand held high in the air confirming their victory while the unique bronze color finish makes this award something special. This Legend of Fame award measures 8 X 6. A large area at the bottom of the award can accommodate all of your personalization needs. This item can either be hung on a wall or placed on a desk using the included stand. This Male Swim Legends of Fame award is a memorable keepsake that will be cherished by the recipient for years to come. 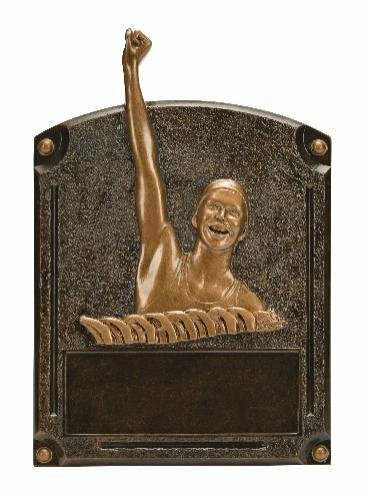 A swimmer is depicted with their hand held high in the air confirming their victory while the unique bronze color finish makes this award something special. This Legend of Fame award measures 8 X 6. A large area at the bottom of the award can accommodate all of your personalization needs. This item can either be hung on a wall or placed on a desk using the included stand. 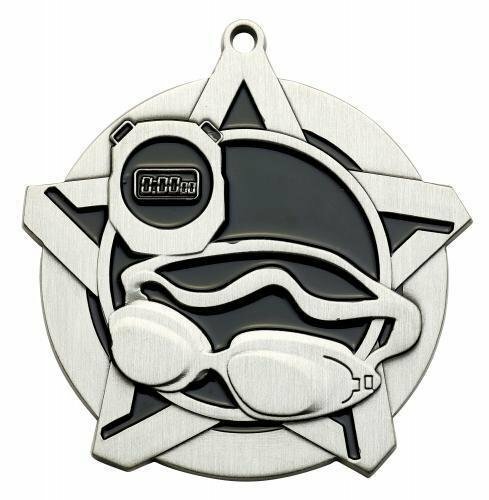 These Swim Super Star medals have a decorative star that frames the center of the medal. Goggles and a digital stop watch fills the front of this 2 1/4" in diameter medal. In addition to many other sports or activities these medal come in your choice of gold, silver or bronze finish. The back of the medal has more than enough room for all of your personalization needs. All you need to do is pick a ribbon and you are all set to go! On your mark, get set, and go with these swimming bobble heads. Coming in both male an female versions, these bobble heads are on their starting blocks and ready to start the race. Both are wearing swimming caps with goggles that are finished in gold tones. These bobble heads stand 5 1/2" tall and have a base that allows for plenty of room for whatever your personalization needs might be making this award the perfect recognition choice. Phone: 215-257-5432 Powered by BizWizard ShopKart by NetSoft Studio, LLC.